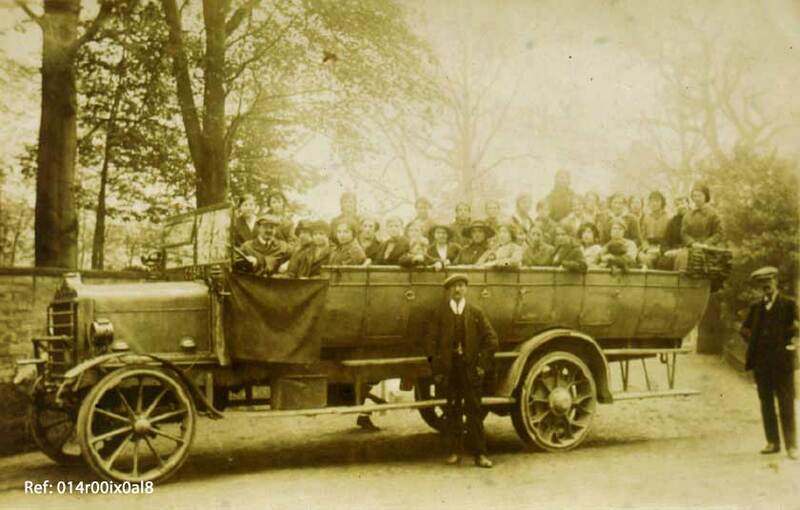 Charabanc and passengers 1919-1920s. In the early 1920s Mr. Horne, landlord of the United Kingdom Inn, Woodrow, organised village trips and this photo show a group of Methley ladies setting out on one such trip. Note solid tyres of charabanc, rain cover folded back and makeshift driver’s door. Mr. Horne is said to be the driver with some of his family on the back seat. 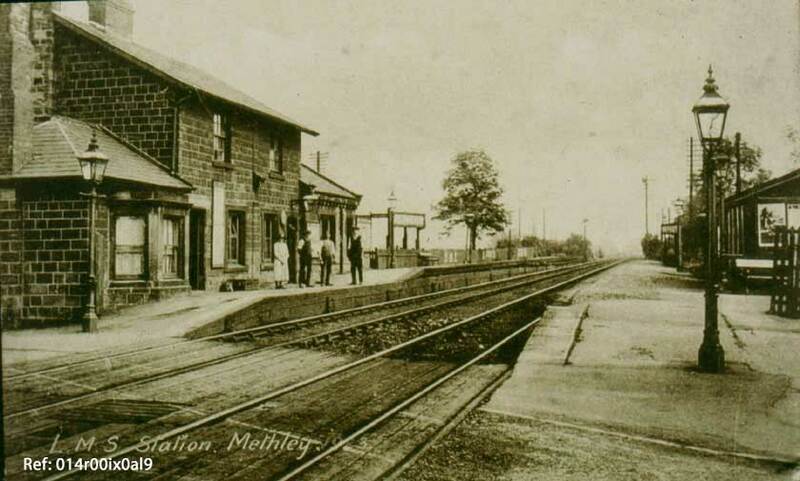 Methley LMS Station, Woodrow, 1920. The station opened on June 30th 1840 when the North Midland line from Leeds to Derby was constructed. It later continued to London and became the LMS (London, Midland and Scottish). In the 1920s it was a very busy village station. Mornings and evenings the platforms were crowded with villagers travelling to their work in Leeds. They had to walk to the station from their homes in the village. The ‘paper train’ delivered morning and evening papers, calling at all stations along the line. Newsagents collected their own papers from the station, one of them, Atacks, in a dog cart; the other, Beards, in a wooden box on wheels. Other shopkeepers collected goods from the station. Express trains, such as the Devonian, Waverley and Thames-Clyde, thundered through the station. Methley LMS Station, Woodrow, 1920. In autumn there were evening excursion trains on Saturday evenings to Morecambe and Blackpool Illuminations The adult return fare was 2s 6d (12½p). As road transport improved, the station was used less – it was much easier to catch a bus in the village than to walk to the station. The station closed to passenger traffic on 16th September, 1957, and finally closed in1963. The photograph shows the Station Master’s House on left – single storey with the bay window of the sitting room. At the far end is the ticket office and waiting room. Standing on the platform next to the lady is Mr Bill Moseley, for many years the station porter and general factotum. Next to him is Mr. Horne, landlord of the United Kingdom. The gas lamp and wooden waiting room on the right are on the Leeds platform. In the foreground is the level crossing. Edward Clark had a boatyard near the station in 1906. 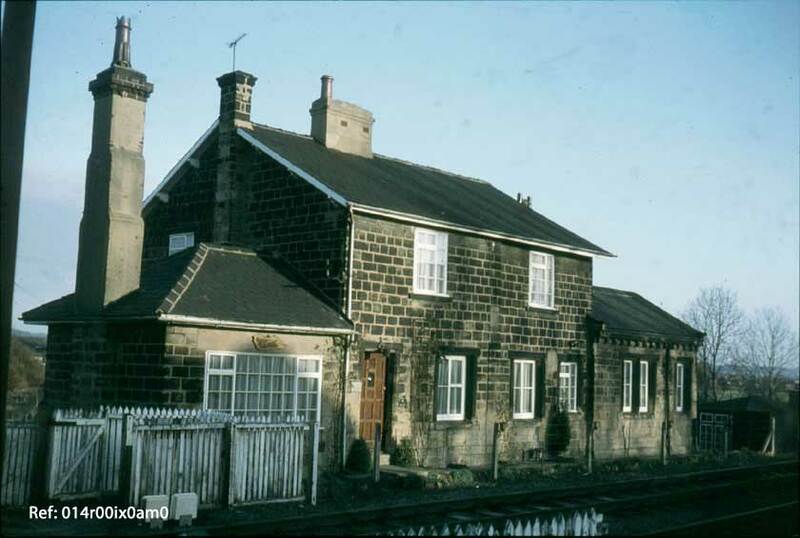 Methley North (Woodrow) Station Master’s House, 1982. It is now a private residence.